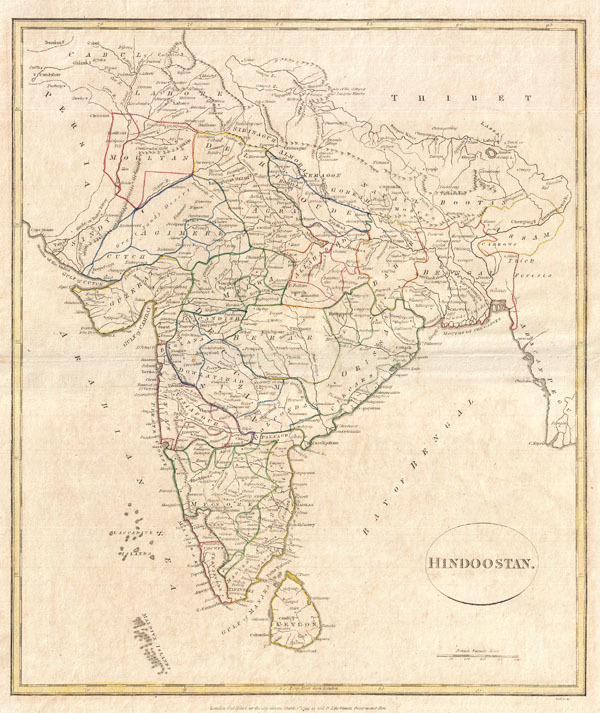 A fine 1799 map India, here labeled Hindoostan, by the English map publisher Clement Cruttwell. Covers the entire subcontinent and is divided into the various princely states. Though there is no specific reference to British dominance in the region, most of India had, at this juncture, fallen under the control of the British East India Company. Includes rivers, political boundaries, important cities, ports and gulfs. Mountains and other topographical features shown by profile. Outline color and fine copper plate engraving in the minimalist English style prevalent in the late 18th and early 19th centuries. Drawn by G. G. and J. Robinson of Paternoster Row, London, for Clement Cruttwell's 1799 Atlas to Cruttwell's Gazetteer.